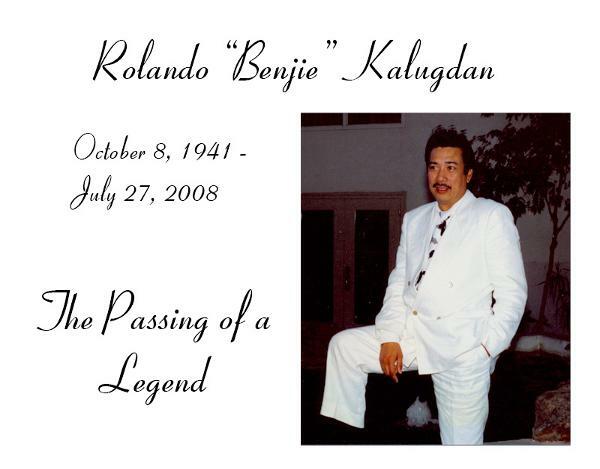 The Dons Fraternity mourns the passing of Rolando "Benjie" Kalugdan. Benjie, a founding member of the Dons, was well-loved in his hometown of Cavite City, Philippines, as well as in the US. He was instrumental in reviving the spirit and activity of the Dons US chapter in the mid-nineties, spearheading the planning efforts for the memorable parties recorded on this site. Benjie cherished his fraternity brothers and all of the good times he shared with them. He is a legend who will be missed. Benjie passed away at home surrounded by family in San Leandro, California. Services were held at Santos-Robinson Mortuary (view their guestbook) August 1-3. You are invited to leave a message here to remember him.